A Canadian police officer offers a hand to a migrant crossing the U.S.-Canada border near Champlain, New York on Wednesday. The Royal Canadian Mounted Police are reporting surges in illegal crossings in Canada in recent months. The Royal Canadian Mounted Police are reporting surges in illegal crossings in Canada in recent months. Officials say Quebec has seen the highest influx of people seeking asylum, with many crossing in remote, snowy areas west of Lake Champlain. One illegal border crossing area has become so popular among immigrants seeking asylum that all taxis in Champlain, New York, know it by name: Roxham Road. It's so well-known that, according to people who live on the road, the Canadian police stay parked on their side of the border most days. In New York state, taxi drivers follow a protocol where they contact U.S. Border Patrol if someone requests drop-off there — the person is still granted their ride, but U.S. officials often stop the cab to check the person's paperwork. Wednesday, an officer in a U.S. Border Patrol car parked at the end of Roxham Road said that by 11 a.m. already two families had walked across illegally. They knowingly walked into arrest by the Canadian police waiting on the other side. Refugee advocates say the reason so many are crossing illegally is because of the Safe Third Country Agreement signed by the U.S. and Canada in 2002. The pact is meant to prevent "shopping for asylum" in both countries; it requires refugees seeking asylum to do so in the country they reach first. Roxham Road is a quiet pastoral road about 20 miles north of Plattsburgh, New York. 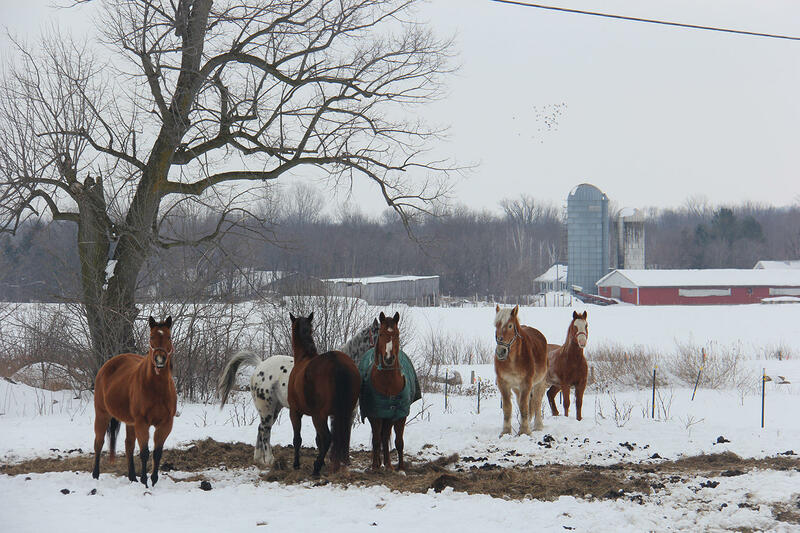 There are a smattering of trailer homes, and a picturesque barn with curious horses outside, their breath fogging the chilly air. 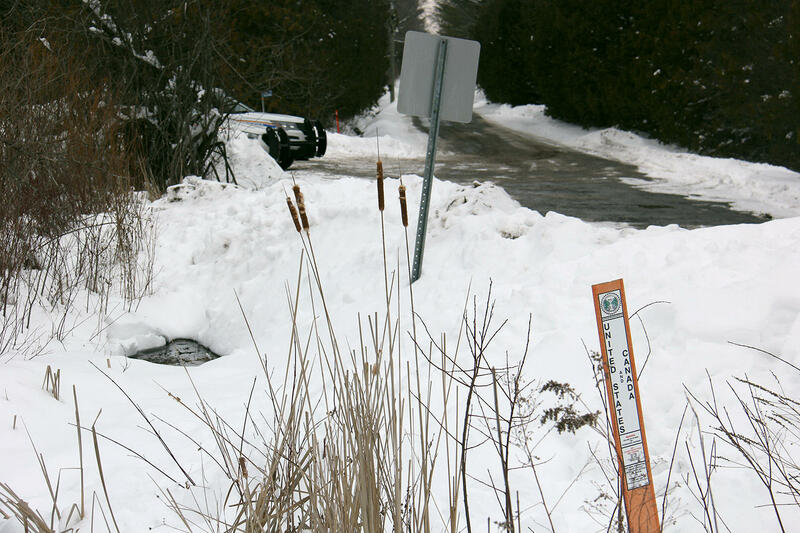 The road itself dead-ends with little fanfare; there's a sign saying "Road Closed" at the end, then a long ditch running east-west that marks the U.S.-Canada border. The only indication that it's an official border is a small 3-foot plastic marker that says "U.S. and Canada." This illegal border crossing is so well-known that, according to people who live on the road, the Canadian police stay parked on their side of the border most days. There are several well-worn paths up and over the snow bank and through the ditch, where many people have walked between the two countries. U.S. Border Patrol has the authority to stop people near the border who officers suspect to be non-citizens, but they cannot detain them if their passport and visa are in order. That's why even refuge-seekers who are clearly intending to walk into Canada can only be arrested on the other side, after they commit the crime of crossing the border not at a port of entry. Just before noon on Wednesday, a blue Honda minivan cab rounds the corner on Roxham Road. It's stopped by the U.S. border patrol, and the officer opens the sliding door and speaks with the woman. Moments later, the taxi is allowed to continue on. The cab drives about a half a mile to the dead end. Dressed in a knee-length black coat and a white knit hat and scarf, a woman passenger gets out. All she has with her is a diaper bag, a black suitcase on wheels — and an infant bundled in a fleece onesie. She doesn't want to speak with journalists, but she seems to understand some English. She hugs the baby to her chest and with her free hand pulls behind the suitcase. As she moves toward the ditch, several Canadian police officers approach on their side, and speak to her. A woman traveling alone with her infant, seeming to understand that she will be arrested, walks toward Canadian police on the far side of the border. "You have to go through the custom, ah, border, but if you do cross here, you'll be arrested, and then we'll take you in charge. OK?" The woman nods, seeming to understand that she will be arrested, and she steps towards them. The Canadian policeman offers to carry her baby as she makes her way through the slippery snow path. She hands him the child, and then takes the hand of the other officer who helps her to the road on the Canadian side. The police bring out a child car seat, and place it into the vehicle. The whole thing only takes about six minutes. Neighbors who live or frequent this road say it's long been popular with illegal crossings — going both directions. Carol Castine and her husband have delivered Meals on Wheels to the last trailer on the U.S. side, a stone's throw from the border ditch, for the past few years. "We have seen different taxis, either parked at the end of the road, or perhaps dropping somebody off," she said. "Because you're that close to border right there. Sometimes they bring 'em, or sometimes they're waiting for people. So we see people going in both directions." Roxham Road, which is now a regular destination for local taxi drivers, is a quiet pastoral road about 20 miles north of Plattsburgh, New York. Castine says she has seen families both walking down this road pulling suitcases, and piling out of taxis. She says they drop off meals at this house five days a week, and she has seen an increase in border patrol presence in recent weeks. "Lately, the border patrols on the Canadian side are quite visible, they’re there quite often, like they're waiting," she says. Royal Canadian Mounted Police say that when they catch people crossing the border they check their papers, run a criminal background check, and if they are not deemed a threat, they bring them to the Canada Border Services Agency. Then, people can file paperwork to apply for asylum in Canada. The Royal Canadian mounted police haven't released numbers on how many people are crossing the U.S.-Canada border illegally. But beginning this past September, the overall the number of people applying for asylum in Quebec has shot up. For example, last month 452 people applied in Quebec — compared to only 137 in January 2016. A U.S. Border Patrol official out of Swanton, Vermont, said that since October, about 1,000 people have illegally crossed into Canada in the northeast. That border section includes eastern New York, Vermont and New Hampshire. If Wednesday is any indication, people will continue to look for ways into Canada. Before noon, already three parties had walked across at Roxham Road, willingly walking into police custody in the hopes of asylum. Royal Canadian Mounted Police are reporting a flurry of illegal crossing into Canada this past weekend. Officials say Quebec has seen the highest influx of people seeking asylum, with many crossing in frigid, remote areas west of Lake Champlain, and ending up in Hemmingford and Lacolle. A Canadian woman who was traveling to Burlington for a day of shopping says she was denied entry to the United States last weekend. She says it's because of her religion.